Spring break has begun! I still have to work, but a week off from classes will be nice – it’ll give me time to catch up on homework and writing. 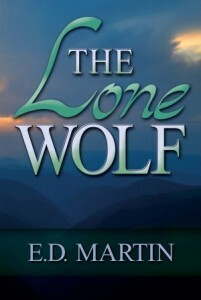 One of my current projects is plotting out the sequel to my debut novel, The Lone Wolf, which I’m excerpting this month. In this scene, Kasey and her six-year-old daughter end up staying at Andrew’s apartment. He’s on the couch, while they take his bed. Kasey has just been awakened in the middle of the night by a noise coming from the living room and is going to investigate. The sound came from a large, dark shape on the couch. “Andrew?” I whispered, cautiously approaching him. but I pushed the thought away. leaned forward and lightly kissed his sleeping lips, then stood and returned to bed. Beautiful writing, ED You captured me from the first sentence. I liked the feel of this excerpt, could certainly envision the scene. It raises good questions too, as far as is he dreaming about so intensely? Great snippet! Wonderful snippet. I agree with Victoria, your writing is like a film in my head. Great 8. You created a such a strong feeling of intensity and gentleness in such a short snippet. Thank you for sharing.